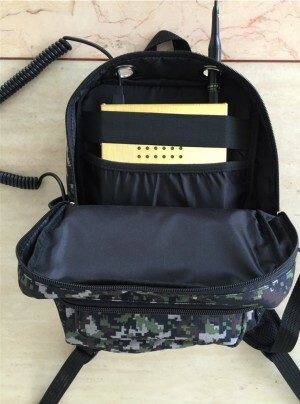 ULTRA COMPACT BACKPACK RADIO!! BUILT-IN BATTERY PACK!! What's better than making the Leixen VV-898 into a go-box? Buying one that's ready to go! Introducing the Leixen VV-898P, the mobile backpack transceiver you can take virtually anywhere you need it! Leixen combined their micro-compact Dual Band UHF/VHF Mobile Radio with a powerful 6A Li-ion rechargeable battery and put it all in a sturdy chassis you can fit in your pack or emergency bag for use anytime, anywhere! Includes programming cable and software - a $15 value! What's better than making the Leixen VV-898 into a go-box? Buying one that's ready to go! Introducing the Leixen VV-898P, the mobile backpack transceiver you can take virtually anywhere you need it! Leixen combined their micro-compact, 10 watt Dual Band UHF/VHF Mobile Radio with a powerful 6A Li-ion rechargeable battery and put it all in a sturdy chassis you can fit in your pack or emergency bag for use anytime, anywhere! The VV-898P transmits and receives on both VHF (136-174MHz) and UHF (400-480MHz) and can receive on 400-520MHz and 200-260MHz, as well as commercial FM radio stations at 87.5-108MHz. The VV-898P has all the features of the stand-alone VV-898, such as 199 programmable channels with channel scanning, dual watch, CTCSS/DCS encode/decode, DTMF, and 1750 Hz burst tone. It has individual call, group call, user-defined channel names, VOX capability and an emergency alarm. It is also repeater capable. The Leixen VV 898P is equipped with a built-in 400mW speaker, backlit front panel LCD display and two front panel LEDs. The included hand microphone has a lighted DTMF keypad and is connected to a coiled cord that stretches over five feet. This is where it gets really interesting. The VV-898P is enclosed in a special chassis with a rechargeable Li-Ion battery designed to power it for hours. It has a 13.8v AC adapter so you can recharge as needed or to power the unit for use on your desk as a base station! The chassis also includes a built-in radiator fan with an on/off switch to cool the unit as needed. Of course, if you want to use the VV-898 as a mobile, you can. The chassis is designed for easy disassembly so you can take the radio out of the box and mount it in your vehicle as needed. A mounting bracket and 12v DC power cord are included for mobile use. The Leixen VV-898P comes with a DTMF hand microphone, AC adapter, DC power cable, mounting bracket, microphone hanger, hardware, USB programming cable, software CD, owner's manual and a one year manufacturer warranty. Antenna sold separately. NOTE: Requires an antenna (not included). Operate your Leixen VV-898P in the field or on the move with the Nagoya NL-R2 whip antenna! This Genuine Nagoya dual band antenna works on 144/430 MHz frequencies with 2.15/3.5 dBi gain at 100W maximum power. The flexible whip antenna is 39cm high and the UHF Male (PL-259) connector attaches the NL-R2 directly and securely to your radio. The Nagoya NL-R2 is perfect for dual band amateur mini mobile backpack radios such as the Leixen VV-898P and VV-898SP! Carry your VV-898P/SP backpack radio just as designed with a Back Pack Bag from Leixen! These backpacks are designed exclusively for VV-898 dual band mobile backpack radios, with a large, interior pocket to hold the radio housing and eyelets on top of the pack to let the antenna and speaker mic cable out of the bag. The Leixen VV-898P/SP Backback Bag is available in two styles, a shoulder bag and camo backpack bag. Surprisingly good quality. Perfect for backpacking or camping. Radio seems to run forever on internal battery charge. Easy to program and customize with CHIRP and supplied CD. It needs some type of bracket or stand so it sets at an angle so you can see the display easily. Fits in backpack and you can travel around with it easily. I use it mostly for local repeater work and have zero problems sending or receiving.